Rescue workers have used helicopters and boats to evacuate hundreds of people stranded on their roofs following unprecedented flooding in the southern state of India where more than 160 people have died, officials said. 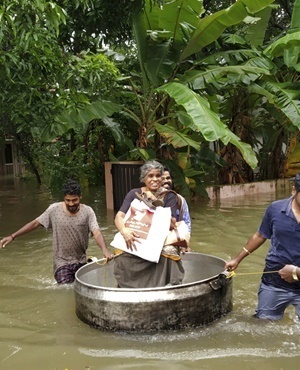 Heavy rains over the past eight days triggered flooding and landslides while also leading to collapse of homes and bridges and severely disrupted air and train services in Kerala state. With torrential rains coming to a halt on Friday, thousands of rescuers worked to shift the marooned people to 1 200 state-run camps where more than 150 000 people already have taken shelter. A defense ministry representative said in a statement on Thursday afternoon that more than 3 000 people have been rescued by the Armed Forces in 12 districts of Kerala while state officials have put the death toll at 164 since August 8. On Thursday morning, Indian Prime Minister Narendra Modi said that he had asked the country's defence ministry to further step up rescue and relief operations across the state. Modi is also expected to visit Kerala on Friday. Hundreds of villages have been flooded, more than 10 000km of roads and thousands of homes have been destroyed or damaged across the state, officials said. Monsoon rains lead to deaths of hundreds of people in India every year.